Spiritually blessed schedules, governed by who we are in Christ, are all about the work God has done in our lives because of and through Jesus. Prioritized schedules, emphasizing love for God and others, center on divine, not human love. Sustainable schedules, requiring that we nurture our relationship with Christ, provide the sustenance we need to keep going. Do you notice the theme? These kinds of schedules require God to be at work in and through us. We need His power if our time management is going to work in ways that cause us to make an eternal difference — to be spiritually productive. What are Spiritually Productive Schedules? To be productive is to be fruitful according to God’s Word. Hence, spiritually productive schedules are ones out of which eternal fruit is born. How do we attain Spiritually Productive Schedules? In order for our efforts … how we are spending our time … to bear spiritual fruit, we must be abiding in our Lord Jesus. He said, “Apart from me you can do nothing.” Finding our sustenance in Him increases our productivity because we are serving out of His strength and power, not our own. See John 15:1-8. That verse was written in the context of the Philippians showing their concern for Paul (v. 11) by sharing in his troubles (v. 14). While it was good for them to help him, Paul acknowledged that he could be content in both the good and bad, with little or much, because of the strength the Lord provided. He was able to be spiritually productive no matter what filled his schedule. 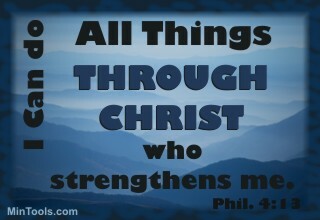 Even when persecuted or imprisoned, he continued to bear fruit, not because of himself, but because of God’s strength at work in and through him. We might be tempted to think that those kinds of conditions, or times of need, would hinder us from being fruitful but the opposite happens when we depend on God for power. In the next post we will look at some of the things that truly could hinder spiritual productivity. ← Previous Previous post: Scheduling Leave Room for the Great Commission?